I like the Sunday farmers market because parking is easier and I get what I need quickly. I also have more opportunity to talk with the vendors and discover things I might have missed otherwise. 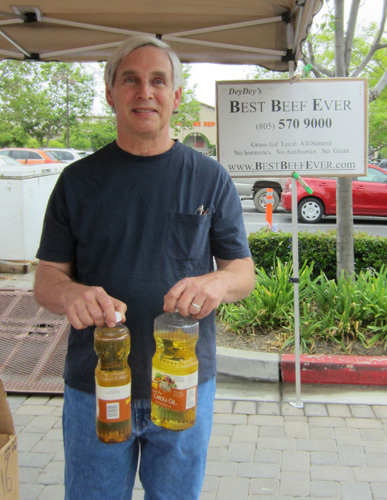 For example did you know that DeyDey’s Best Beef Ever runs their trucks on vegetable grease fuel? They are happy to take donations of used cooking oil. Just pour your cooled oil into an empty container and take it their booth at the Sunday market! Yesterday we dropped off two quarts. 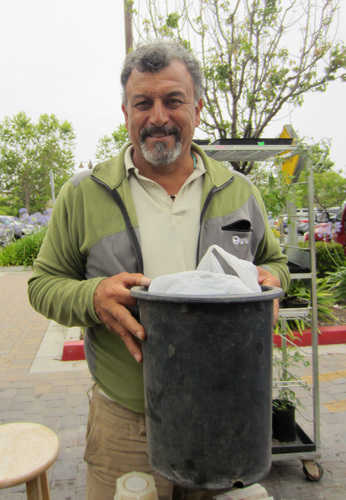 We also stopped at the Healing Grounds Nursery booth to give Oscar Carmona a collection of pots we had saved from plants that we’d bought and planted. Instead of recycling them, Oscar will re-use them. Plus we got a chance to visit with Oscar, whose knowledge about what to plant when and where always gives my vegetable garden a good head start. He can also get you started composting with worms. Talk about recycling! Worms make quick work of transforming our kitchen cuttings into nutritionally rich aerated soil. Oscar has the worms available in the blue bin, fresh from his compost beds. My other recent discovery is the soap at the Joëlle Olive Oil booth. It’s pure Castille soap (made with olive oil… originally from Castille, Spain) that lathers well and comes in a variety of fragrances as well as fragrance-free. I bought myself a Ginger Lime soap and gave several others as Mother’s Day gifts. It’s a hard soap that will last longer than softer soaps and has an elegant beveled edge. If you haven’t been to the Sunday market, it’s definitely worth a morning walk. 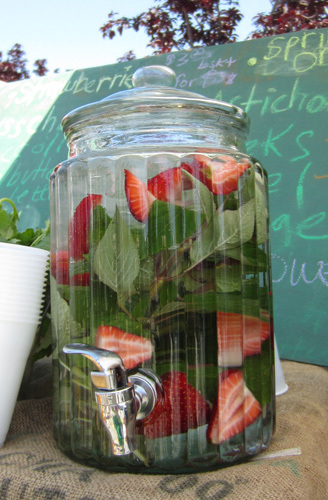 Fresh water with a hint of strawberries and mint. Look for this display at the Sunday farmers market in the Camino Real Shopping Center. An elegant example of how a little attention to artistic detail and fresh ingredients can make even the simplest item appealing, attractive, and delicious. You’ll find this at the Ellwood Canyon Farms booth along with a equally stunning display of freshly picked farm produce. 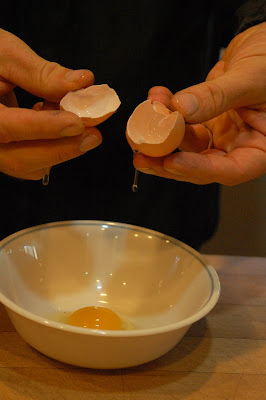 Which Came First, the Chickens or the Eggs? In our case it was the eggs. 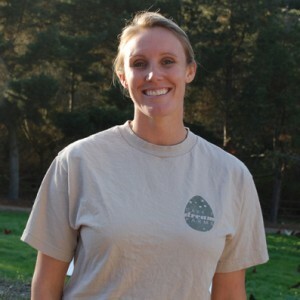 Dare 2 Dream Farms sells eggs at the Isla Vista Co-op. These rich orange-yolked eggs have a sweetness that takes breakfast to a new dimension. It’s best to go to the Co-op on Tuesday when the eggs are delivered. Later in the week you might be disappointed. They sell out quickly. You can also find them at New Frontiers in Solvang and San Luis Obispo. 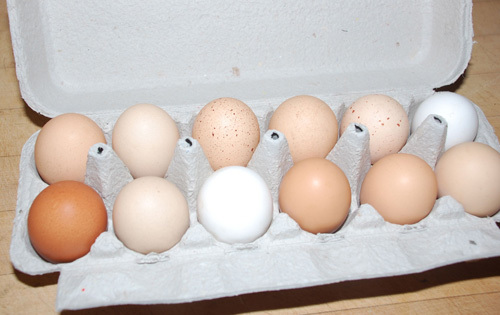 Dave bought this carton of eggs on Tuesday. I love opening the box to see the variety of eggs. 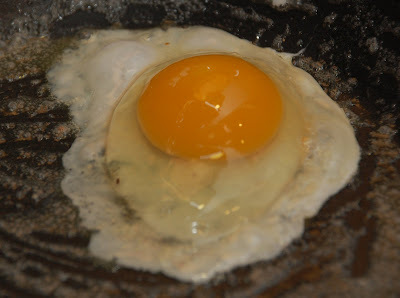 Sometimes there are deep rust-colored eggs. Often there are blue eggs in the mix. 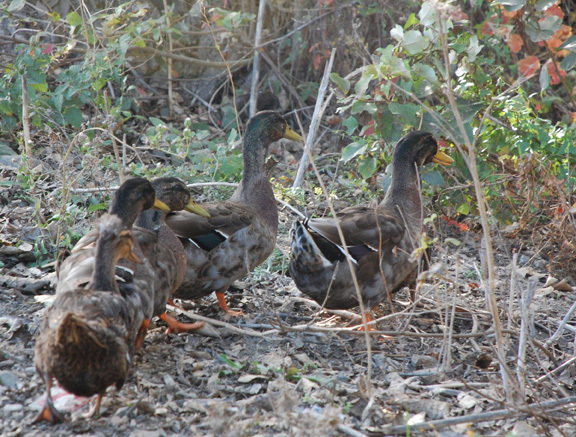 Some are speckled, some are not. Some are small and some are large. Megan at Dare 2 Dream answered many questions for Shaun as he raised his first chickens (such as do you think this is a rooster?). 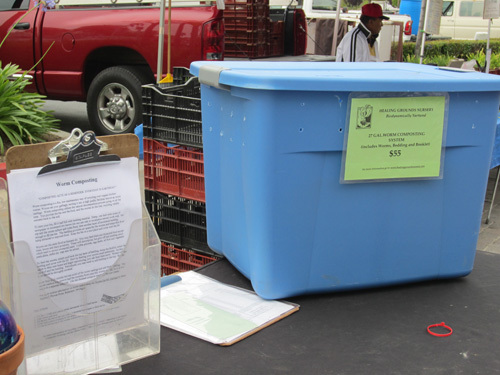 Dare 2 Dream sells chickens and coops for those who want to raise their own chickens. 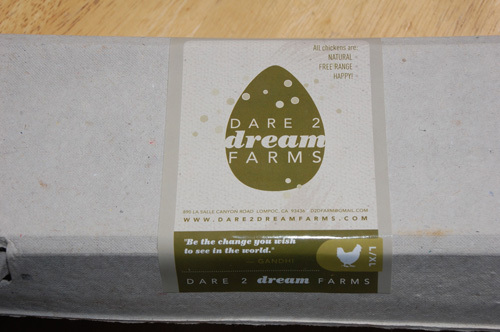 Two of our chickens came from Dare 2 Dream Farms. 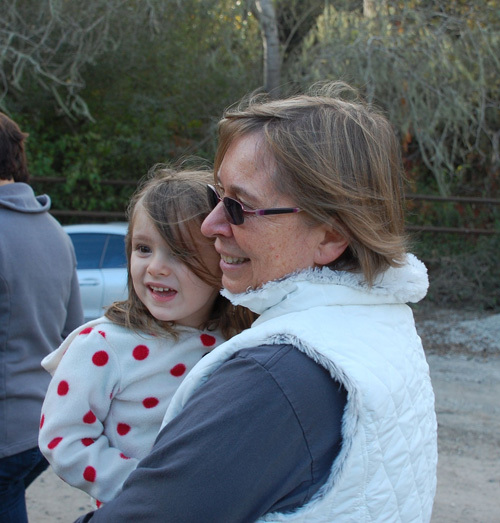 So when Gerri French announced a Santa Barbara Food and Farm Adventures meetup at Dare 2 Dream, I signed up immediately. I took Saraphina along to see if we could find Frieda’s and Georgia’s mommy. Nope, that’s not their mommy. There are a LOT of chickens at Dare 2 Dream. Just about everywhere you look. It’s easy to see why their eggs taste so good. 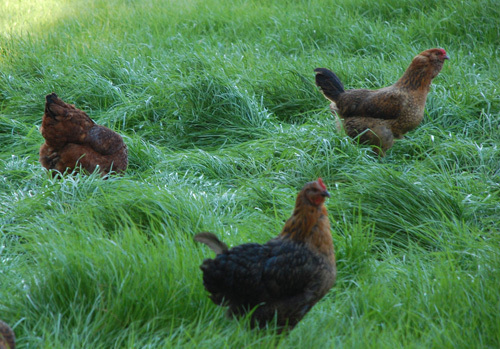 This is a chicken paradise with plenty of fresh grass, worms, and bugs to eat. 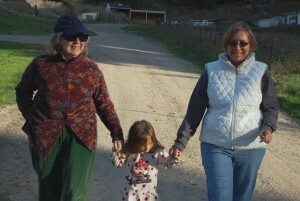 We headed up the road to the chicken house with our friend Shyama. 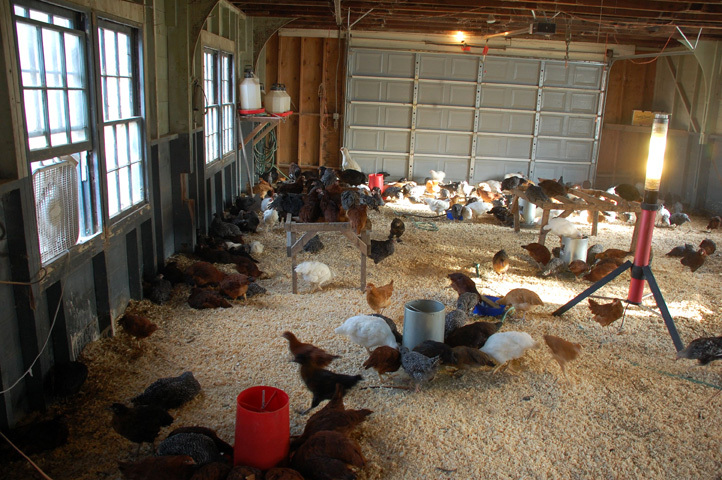 The chicken house is where the young chicks live until they are big enough to forage outside. For our baby chicks, it was a large box in Shaun’s music room with a light to keep them warm. That worked until they started flying around the room and hanging out on his music stand. Back outside there were chickens on the road, in the grass, and in the bushes. Saraphina said, “I think maybe we can’t find the mama.” I agreed. 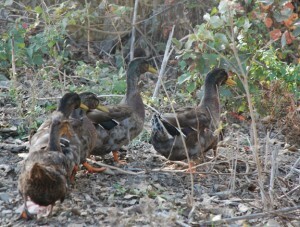 There were a lot of mama chickens around us. After visiting the farm, we are even more enthusiastic about Dare 2 Dream eggs than we were before. Could that be possible? We got up early this morning to go to the Fisherman’s Market to buy some freshly caught fish directly from our local Santa Barbara fishermen. I bought sea urchin while my husband Dave chose some fish from a fisherman down the row. Urchin diver Stephanie Mutz shared a recipe for scrambled eggs with urchin and we talked about possible variations. I bought two big beautiful live urchins. When I got home I cleaned the meat out of the urchins. 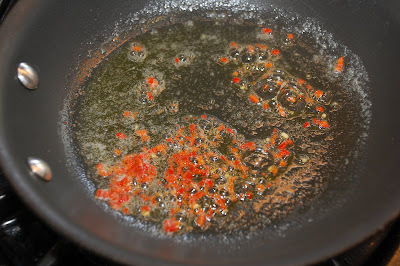 Dave heated some oil with fresh garlic for a quick saute of the urchin pieces. 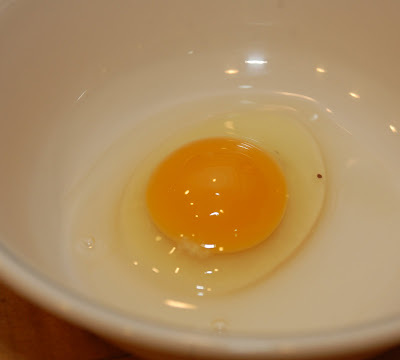 We had four eggs from my son Shaun’s backyard chickens, two brown eggs and two blue eggs. 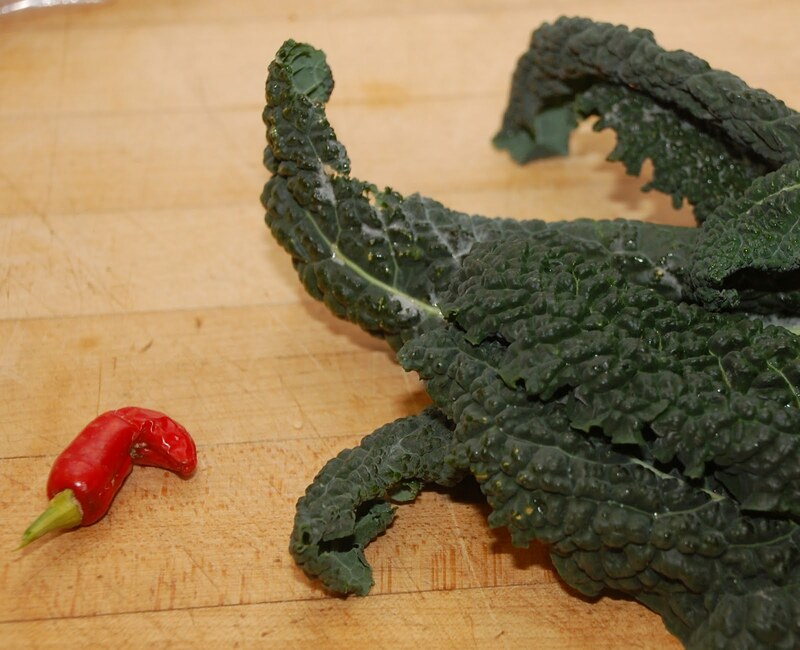 I went outside to pick a chili pepper and some kale leaves. I diced a locally grown organic tomato and salted it to draw away some of the juices. After mincing the chili and chopping the kale, I heated the chili in a couple of tablespoons of local olive oil and began to scramble the eggs. I put the urchin pieces into the scramble just as the eggs began to set. When that was hot, I wilted the kale in it. 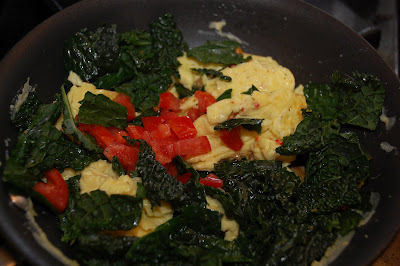 The diced tomato went into the scramble just before serving. I set aside a few freshly diced tomatoes for garnish. 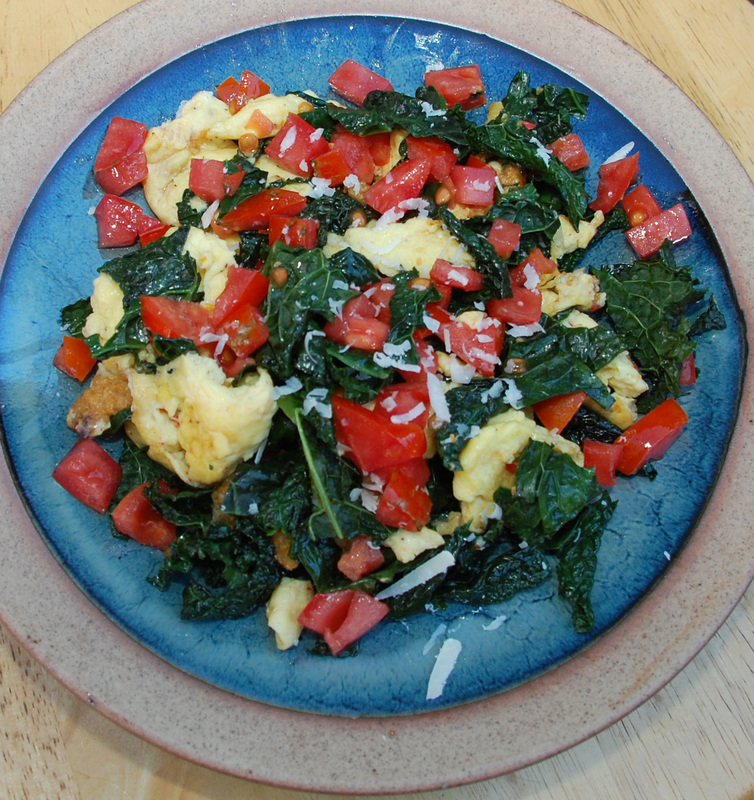 I topped each serving with freshly grated Parmesan cheese. 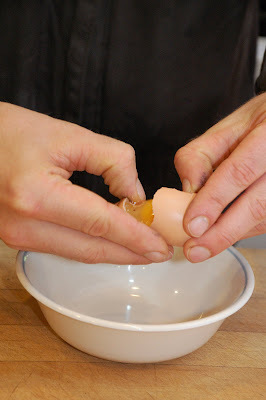 Shaun’s wife Kris wasn’t sure she’d like urchin with eggs but changed her mind quickly after tasting this. That’s a piece of urchin at the middle left. Smaller pieces are integrated into the scramble. We saved a few urchin pieces for pizza later today but this is a brilliant way to use fresh live urchin purchased in the morning before breakfast. Formerly the shy one, Frida has been acting really strange lately. Even the other four chickens think she has been possessed by an alien being. Then last night Shaun found this in their nesting box. 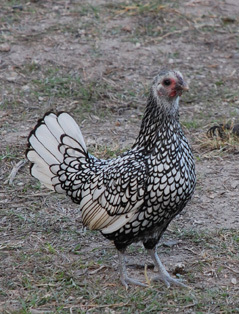 Shaun has raised three of these chickens since they were 1 day old (Zelda, Frenchie, and Abigail). 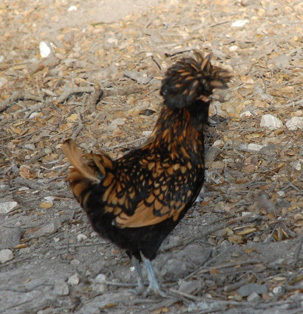 Frida is one of two chickens we got partially grown from Dare 2 Dream Farms in Lompoc. 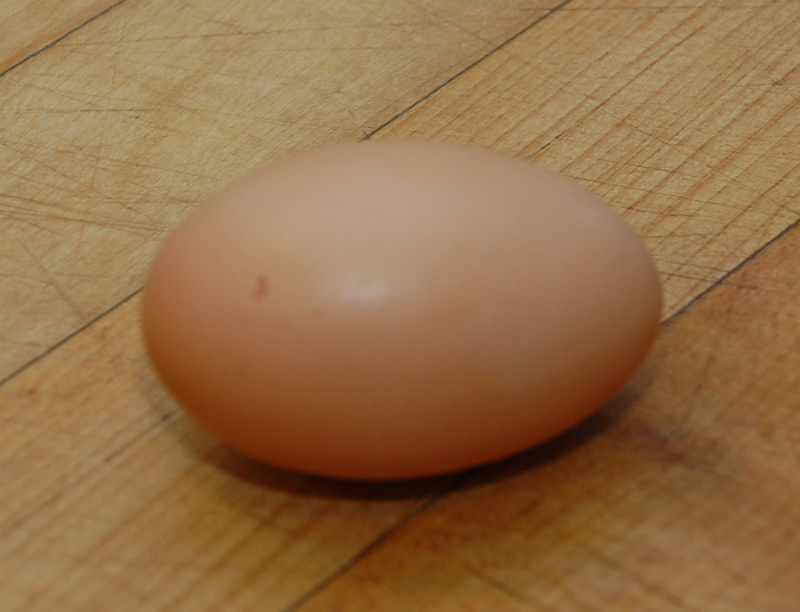 We were warned that we might not see any eggs until the days begin to get longer. Apparently Frida didn’t get the memo. Breakfast this morning was an exciting event. We gathered for the egg opening. It was everything we’d hoped. Good color, thick shell, standing yolk. 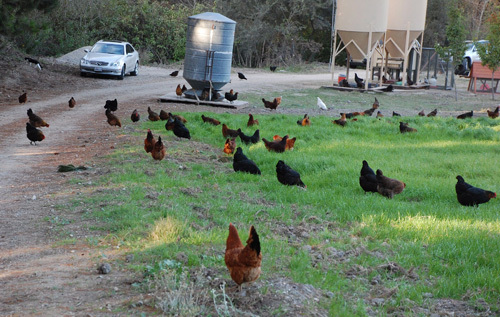 These chickens spend their days in Shaun’s side yard where they wander around eating bugs and the plants Shaun grows for them. They have intimidated the local cats into becoming vegetarians and managed to elude the raccoons a few nights ago who discovered before we did that the chickens weren’t safely bedded down in the coop for the night. 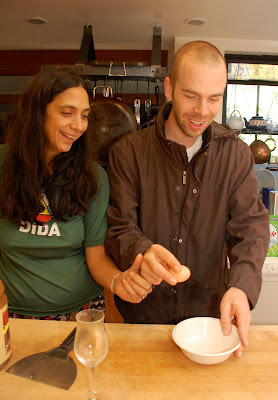 Yes, Frida’s egg was delicious! On a visit to Martian Ranch and Vineyard to learn more about their farming methods, I tasted the syrah grapes still hanging on the vine, sweet, ripe, and ready to pick. Winemaker Michael Roth let me bring a cluster home to make a wild yeast starter. Wild yeast cells cling to the waxy coating on the outside of the grapes at this time of year. These particular grapes are grown in Los Alamos, so this yeast is a variety that grows in that orchard on that variety of grape. Yeast on the nearby Mouvedre grapes might produce a starter with different characteristics. At home I rinsed the grapes lightly and put them into a thin mixture of flour and water. I covered the container with plastic wrap and let it sit until the yeast began to bubble up in the flour mixture. This took less than 24 hours. I strained the starter, purple with grape juice, and added more flour and water. I repeated that process until my starter was bubbling up within a couple of hours after being fed. 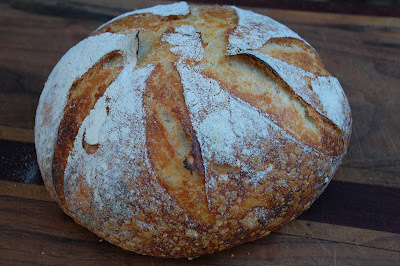 Last night I mixed up a batch of bread to rest overnight and then baked my bread in the morning. I’ll be making more of this! 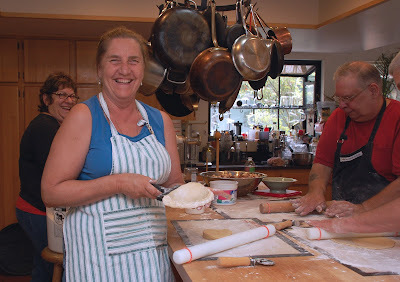 I promised I’d go back and blog about some previous kitchen adventures, so I’ll start with our Pasty Party last August. I’m lucky to have friends who are great cooks. Bob and Dianne Armitage used to own a restaurant in Iowa. One of Bob’s specialties is Cornish pasties. His grandma used to make them. Bob says the miners in Wales took pasties to work for their lunch. Sometimes the pasty was divided… half meat and half fruit. 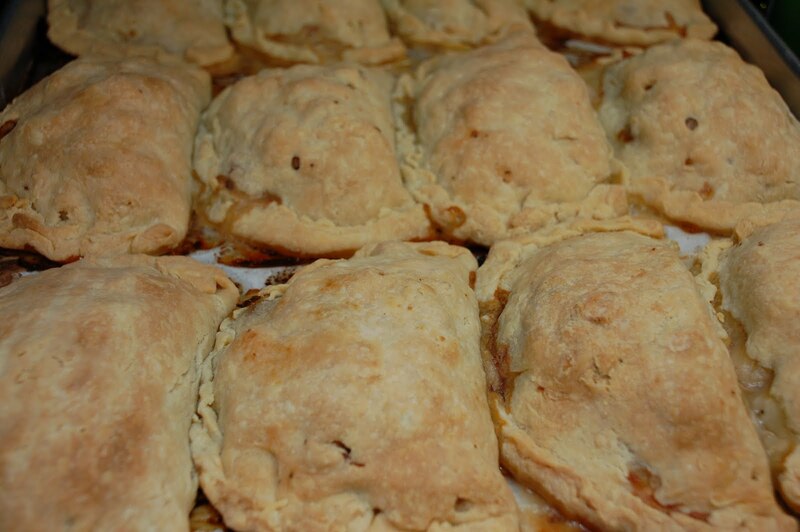 For those who haven’t had them, a pasty is a meat-filled turnover, sealed so the filling doesn’t fall out. They are usually made with a meat and root vegetable filling. 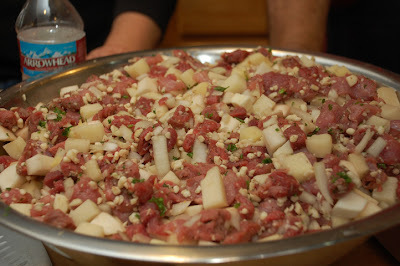 The secret ingredient is suet (the fat that surrounds the beef kidney). 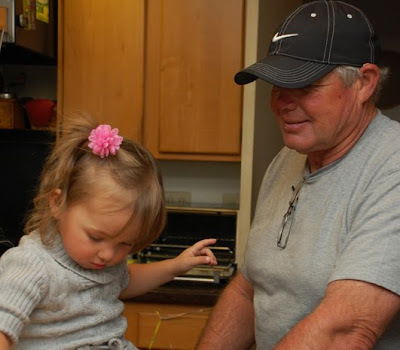 The first time we made them together, we couldn’t find suet anywhere. Bob searched all over town. We had to settle for another type of fat for our filling and pastry. Then when I was interviewing John de Bruin for my grass-fed beef article, he told me that Dey Dey’s beef sells suet. I quickly made a mental note to rush to the computer when I got home to email Bob that I’d found it! At the next Sunday Farmer’s Market I ordered a lot of beef suet and explained to John’s wife Nadine what I was planning to use it for. 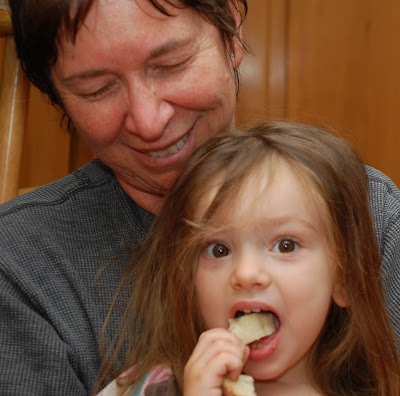 She offered to bring the suet to my house and make pasties with us. We all agreed that we should make a LOT of pasties. That meant peeling a lot of potatoes, parsnips, and turnips. 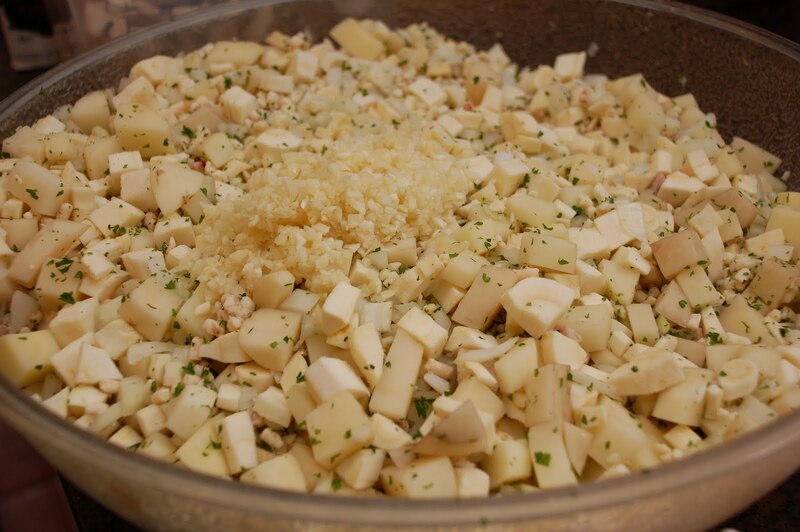 Once they were peeled we cubed them and added minced garlic. Hmm, not enough garlic. 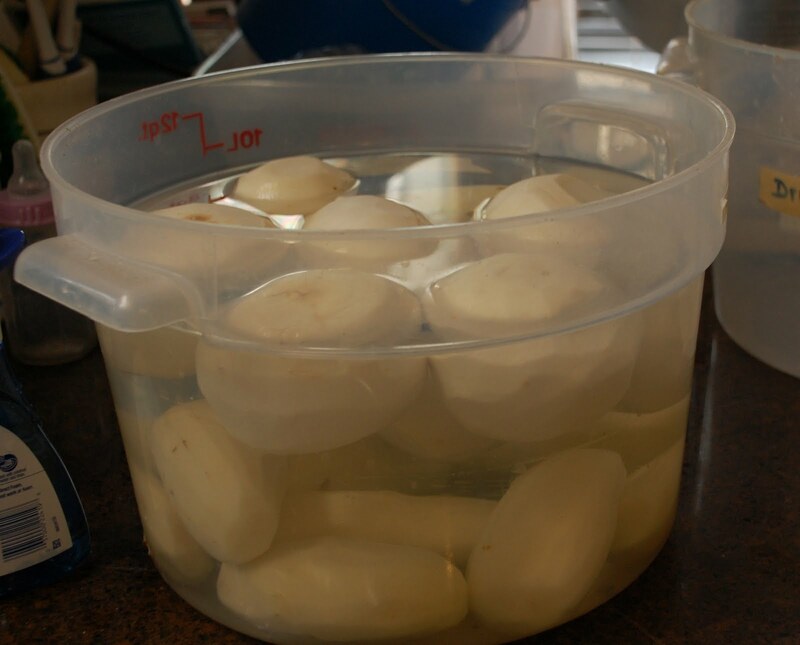 Bob sent Dianne out to buy more garlic. 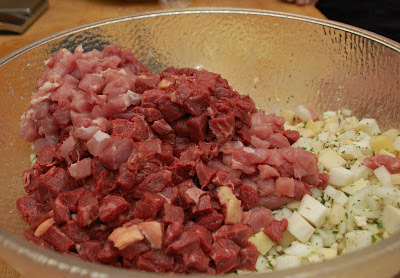 There’s also some parsley in this mix and a lot of diced (she wipes away the tears) onions. We used pork and Dey Dey’s beef with the turnips, onions, and potatoes for one batch. We diced our meat about the same size as the vegetables. We also made lamb pasties with parsnips and mushrooms. I made the pastry dough ahead of time and chilled it. 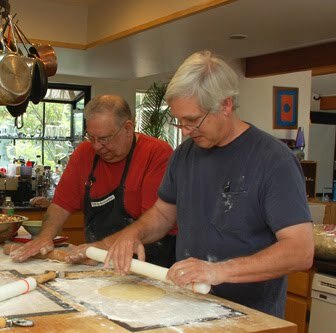 The next step was for Bob to show us how to roll the dough and form the pasties. Nadine made the first pasty. 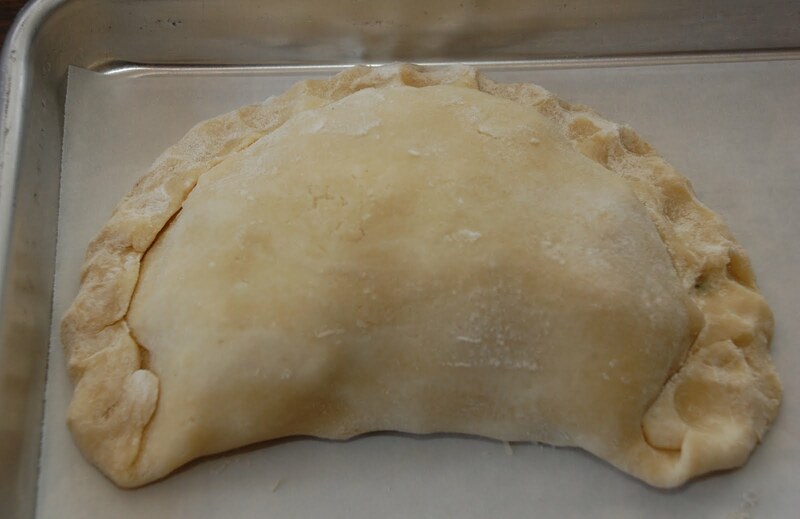 Bob told us that the folded edge around the pasty was traditionally made wide and thick so the miners could hold onto it while they ate the center of the pasty. The miners probably didn’t have clean running water to wash their hands before eating. They didn’t eat the edge… unless they were really hungry. We had to figure out how to distinguish the lamb from the beef/pork pasties so I used my alphabet cookie cutters to put an “L” on each lamb pasty. We baked the pasties until the tops were nicely browned and the juices were flowing from the cooked meats. It took about an hour. The final step was to brush the top of each pasty generously with melted butter. 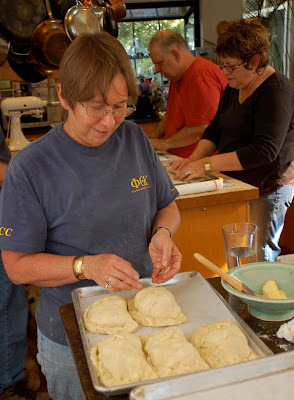 Dianne said that back in Iowa, Bob’s pasties sold out quickly as news would pass though town that they were available. We were not surprised. A recipe? Bob doesn’t need a recipe. 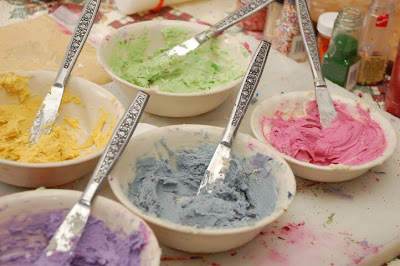 Use your favorite unsweetened pastry dough and design a filling based on your own tastes. I’ve made pork pasties with butternut squash, potatoes, and kale. 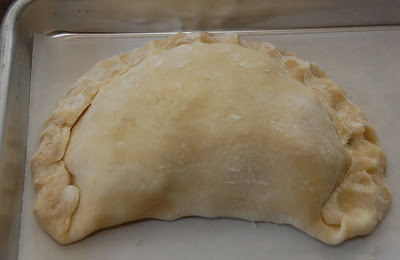 You could also make a vegetarian pasty, but use plenty of oil or a sauce in the filling so it doesn’t taste dry. Bob came up with some great ideas for a Thanksgiving pasty. We’ll keep you posted. 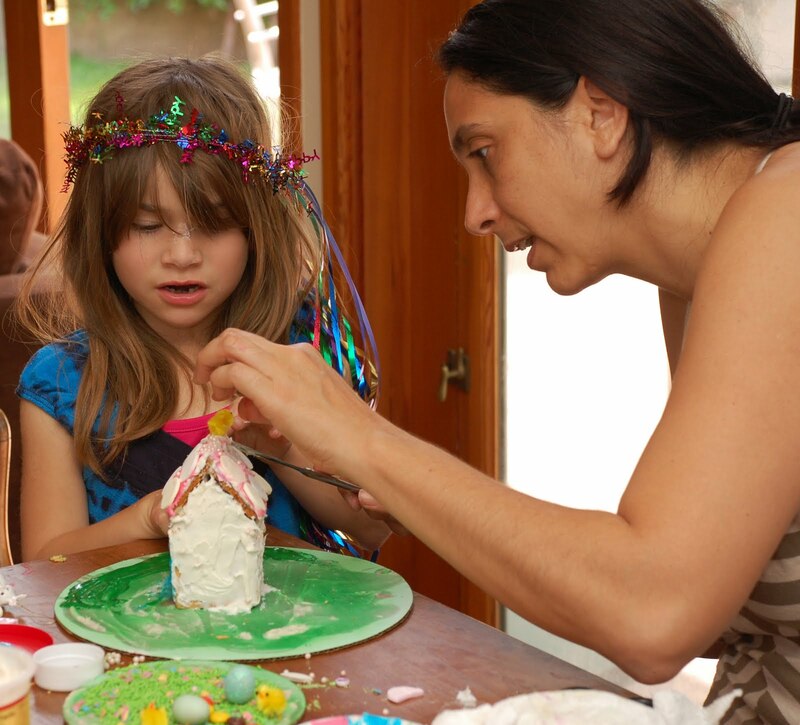 I figured since it’s almost Easter, we should make bunny houses. 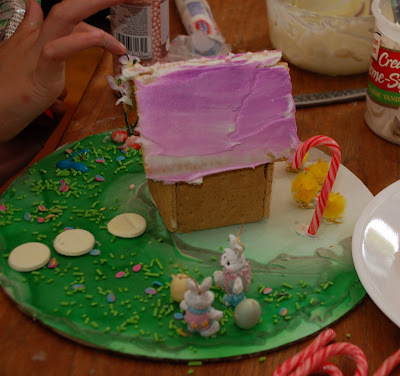 The graham cracker version of a gingerbread house looked pretty easy in the photos on the Internet. So I gathered together some ingredients and a couple of extra kids to work with us on this project. Sticking together the graham crackers wasn’t as easy as I’d hoped. Trying to avoid canned frosting, I used melted chocolate for the wall cement. That required putting the joined walls into the freezer to harden the cement. 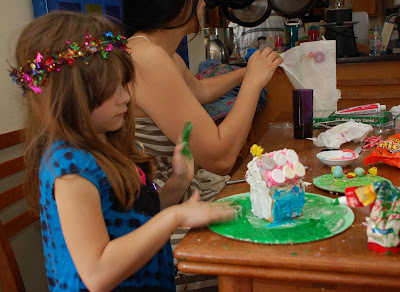 We used white chocolate sprayed with green food coloring on the cake boards and added green sprinkles for the grass. Then we put our houses onto the grass. Fortunately my daughter-in-law Kris decided to run to the store for cans and bags of prepared frosting, throwing all hopes of these being “healthy” candy houses to the wind. As you can see the shingles are Necco wafers. 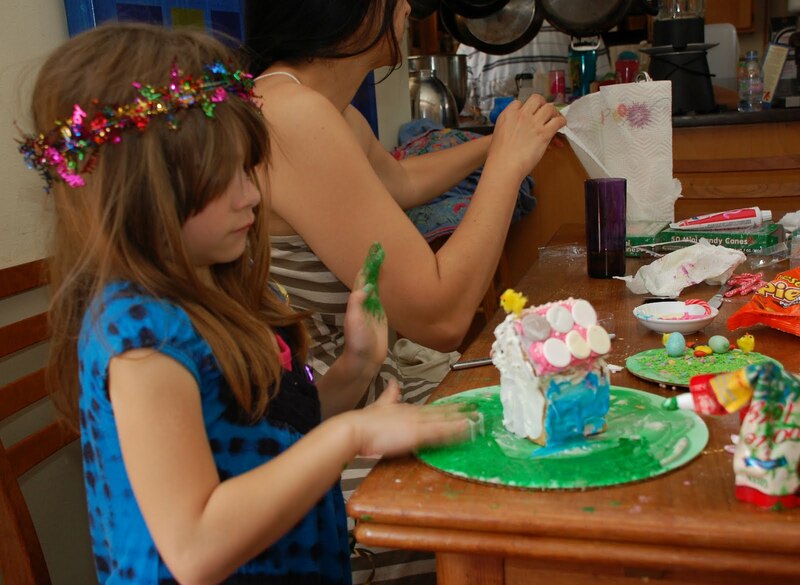 Building houses takes a lot of concentration (and finger licking). Here Kris helps to apply a baby chick to the roof of Fifi’s house. Meanwhile, Aliyah added some flowers to her roof. 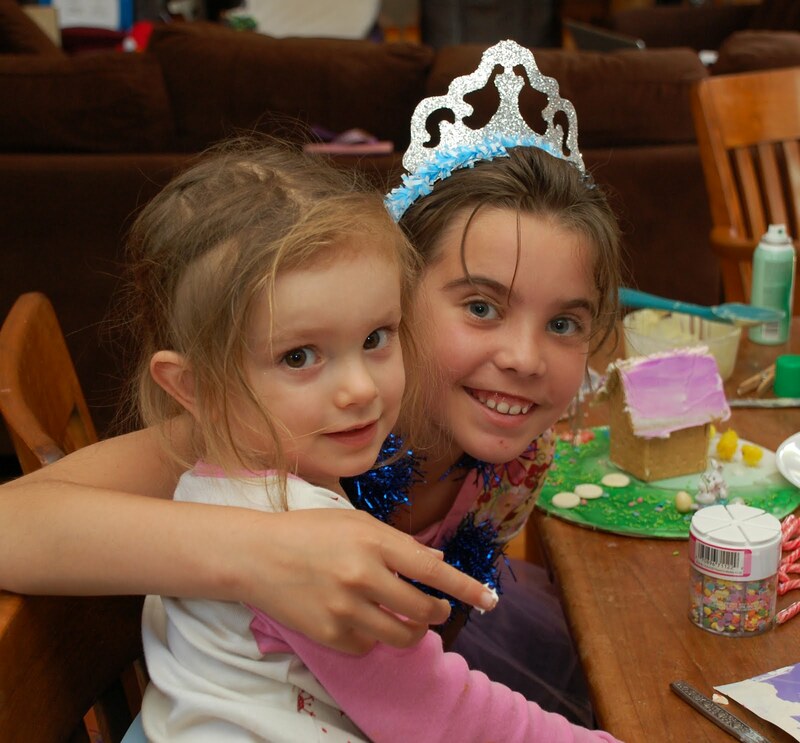 Saraphina was happy to have these lovely princesses helping her with the candy house project. Phina’s house came out quite beautiful. She was especially fond of the pink pearls and her rabbits seem quite pleased with their new home. I’m a bit behind on blog posts. This, of course, doesn’t mean that there hasn’t been a lot of cooking in my kitchen, just not enough time to write about it. I’ll backtrack a little after this post to post some photos of previous cooking adventures. 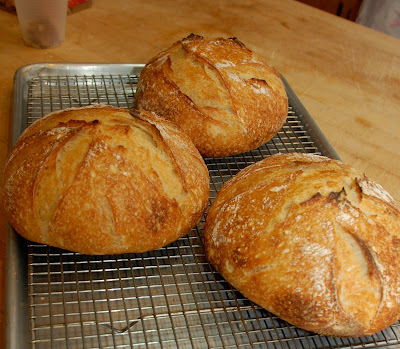 These are made with the sourdough starters I developed for my Winter Edible Santa Barbara article on making bread with wild yeast. Two of the starters are made with grapes from Alma Rosa Winery, two were made with yeast from a locally grown wheat. None of these breads have commercial yeast in them, just wild yeast starter. Yes, there were actually four loaves, but one didn’t last long enough to be in the photo. Yesterday was our annual Cookie Bake. It has been 16 years since we started this tradition. 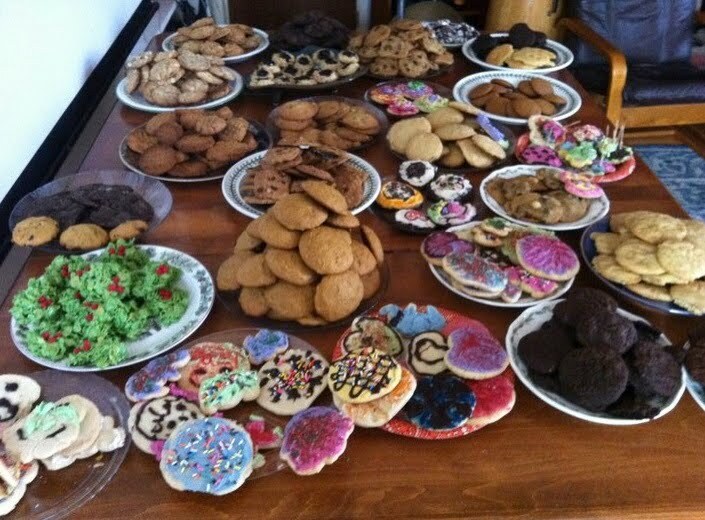 My family really likes to bake cookies. Our grandparents made lots of cookies and candy during the holidays, and other times of year as well. 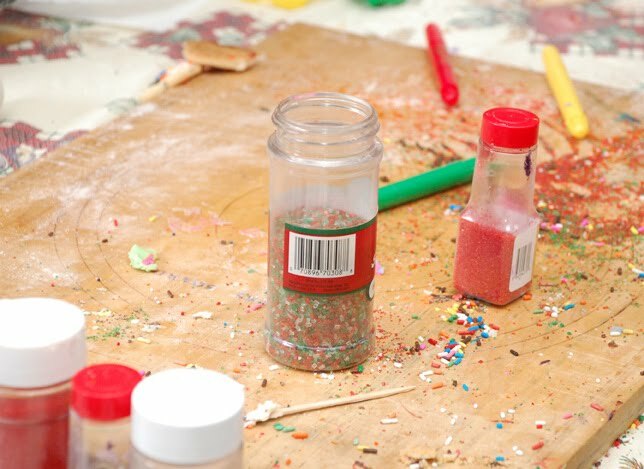 So we gather on the Saturday after Thanksgiving to share this tradition with the next generations. 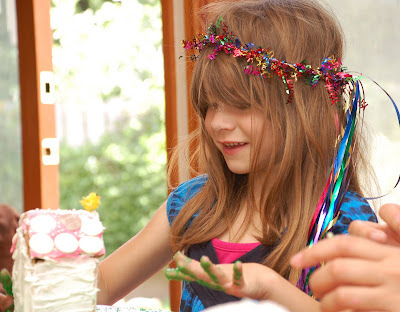 The youngest kids do the decorating, although some of the older generations participate. Dave’s sister made up a really large batch of icing and the kids colored it. She also brought a load of sprinkles. 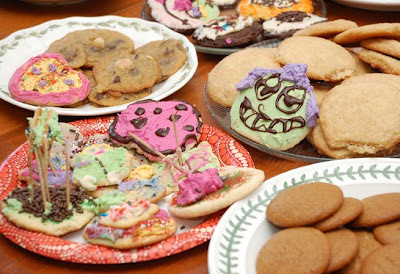 Most of these ended up on just a few cookies. At one point there was a contest. The theme seemed to be More is Better. Here are a few of the simpler ones. 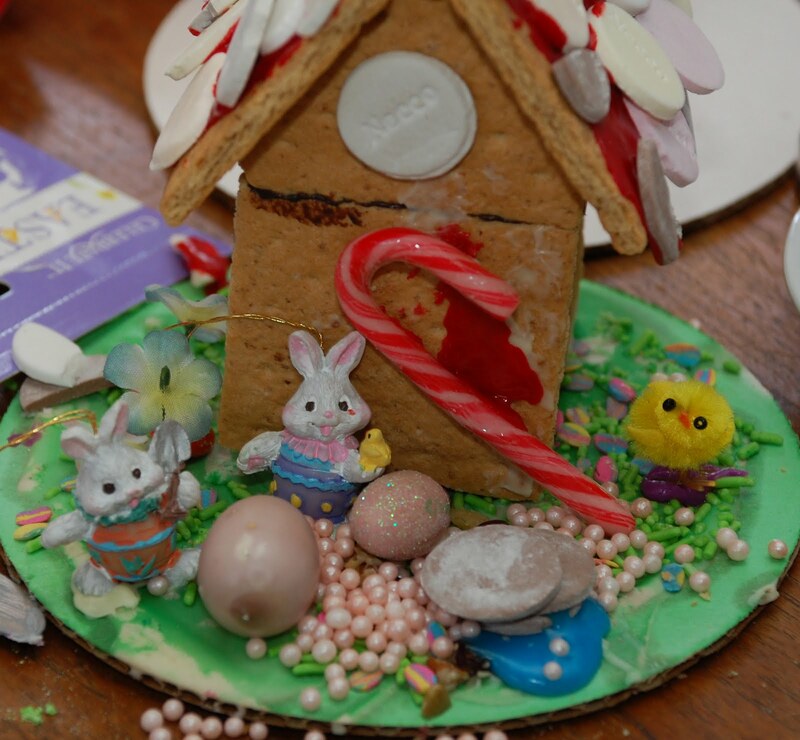 Here are some that were in the competition. 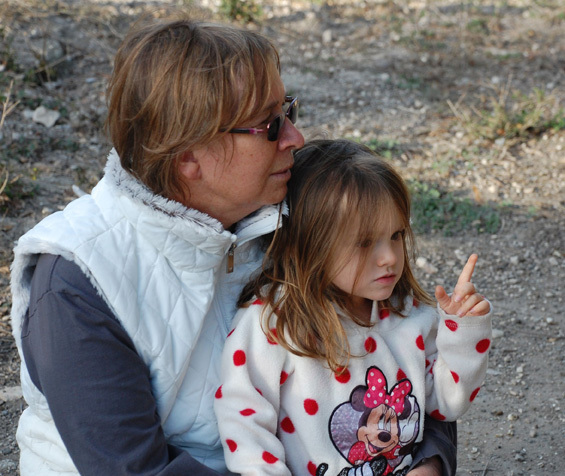 The prize was… a cookie! Meanwhile, the older family members were working away in the kitchen on various batches of dough they’d brought to try out this year. One was chocolate chipotle. So we’re off to a good start for the holiday season. 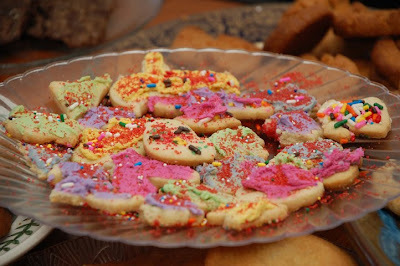 As you can guess it’s not so much about the cookies as the chance to be together doing something we enjoy.